Denton Henry Kimble, age 90, of Petersburg, WV passed away on Tuesday, March 20, 2018 at his residence. Born January 9, 1928 in Smoke Hole, WV and was the son of the late Charles and Mary Susan (Judy) Kimble. In addition to his parents, he was preceded in death by his wife, Bessie (Alt) Kimble on October 10, 1983 and two sisters, Gertie Shreve and Goldie George. He was the last surviving member of his immediate family. 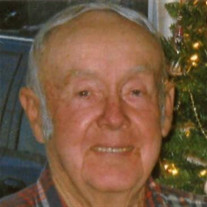 Mr. Kimble is survived by one daughter, Wanda Bible and husband Ronnie of Petersburg, WV and one son, Mark A. Kimble of Petersburg, WV; one step son, Roger D. Alt of Upper Tract, WV; one granddaughter, Kimberly B. Hartman and husband Eric W. Hartman of Petersburg, WV; two great granddaughters, Cheyenne and Taylor Hartman; two step granddaughters; four step great grandchildren and one step great-great grandchild. Mr. Kimble enjoyed sitting on the bench at Shop 'n Save talking with his friends. Family will receive friends on Thursday, March 22, 2018 from 6 - 8 p.m. at the Schaeffer Funeral Home in Petersburg, WV. Funeral service will be on Friday, March 23, 2018 at 11 a.m. at the Schaeffer Funeral Home with Rev. Harold Cullers officiating. Burial will follow at the Cherry Hill Cemetery, Upper Tract, WV. Memorials may be made to the family, c/o Schaeffer Funeral Home, Petersburg, WV.